With hundreds of odd, obscure, intriguing and inspiring questions, this fun and fascinating multiple-choice trivia tour of church history is perfect for group activities, or as a ready source of entertainment and education for individuals. 260 pages, from Barbour. It's time to put your church-history antenna on high alert! Did you know that "Silent Night" was written for the guitar? Or that former president Nixon was a Quaker? This bargain-priced collection of church trivia questions was mined from centuries of religous history. It's great for laughs, icebreakers, parties . . . even sermon openers! Who said, 'Within 100 years of my death, the Bible will be extinct?' For what instrument was 'Silent Night' originally written? What was the denominational affiliation of former president Richard Nixon? If you knew the answers are 1) Voltaire, 2) guitar, and 3) Quaker, you'll probably succeed at 'Church Challenge' a multiple-choice trivia tour of church history. 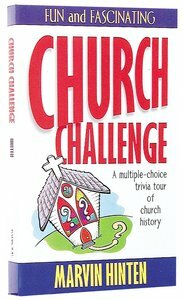 Even if you don't know all the answers, 'Church Challenge' is still a fun and fascinating trip through hundreds of years of religious history. Hinten has led prayer and study groups in five states and written numerous articles for Christian magazines. An English professor at Friends University, he holds a Ph.D. from Bowling Green State.